Yes I've really done it this time, friends. If you went vegan and sugar free and thought you would never again taste a legit chai latte...think again loves. I've saved the day...again 😊😜 enjoy! Just look at that foamy goodness! 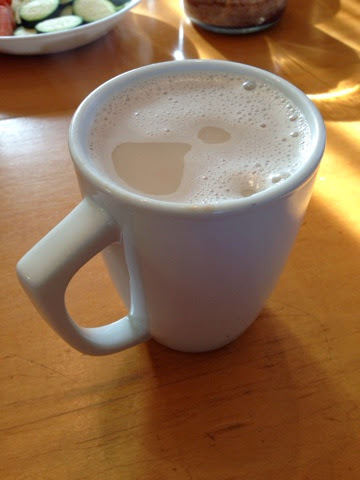 Vegan Chai Latte; Vegan, Gluten-free. Serves one. 1. In a small soup pot, combine almond milk, steeped tea, and stevia. Tuscan Veggie Pasta with Homemade Hummus. What began as a "quick weekday lunch after class" quickly turned into another delicious recipe creation! No surprise there, right?! This yummy veggie-based meal is packed with protein and fiber to keep you going all day long! And as usual,100% oil free, sugar free, and added salt free. Oh, it tastes pretty good too! 😉 enjoy babes! 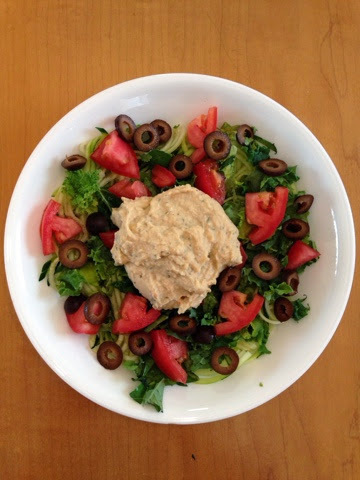 Tuscan Veggie Pasta with Homemade Hummus; Vegan, Gluten-free. Serves one. 1. Spiraling your zucchini Int'L noodles and place in a large bowl. 2. Top noodles with chopped tomato, kale, and sliced olives. 3. In a food processor, combine chickpeas, lemon juice, seasonings, and tofu. Blend till very smooth, scraping sides as needed. 4. Top pasta with hummus (if you have some left over like I did, it's delish on toast! Mmmm!) and a sprinkling of black pepper. Serve with a side salad with balsamic. YUM! Perfect meal. Holiday post! 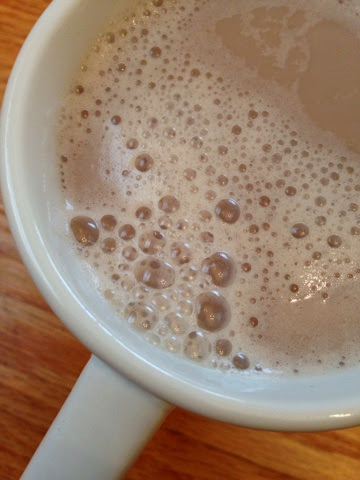 : Cherry Coconut Almond Milk Latte. One word: DELICIOUS. Oh man this thing is SO BOMB you guys! And it's so perfect for Valentine's Day! I'll bet this latte will have you quitting your coffee ONCE AND FOR ALL! But don't take MY word for it...give it a try! After all, it takes 5 MINUTES TO MAKE! Enjoy! 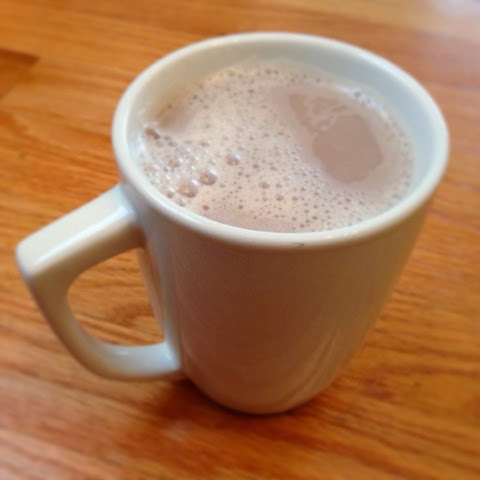 Cherry Coconut Almond Milk Latte. 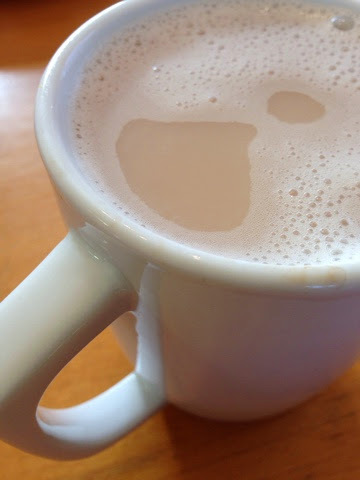 Cherry Coconut Almond Milk Latte! Vegan, Gluten-free. Serves one. 1. Boil 1 cup water and steel tea bag for 10 minutes (you can do this ahead of time like I did! Just leave in the fridge until ready to use.). 2. In a small soup pot, combine steeped tea bag (squeeze out for maximum flavor! ), almond milk, and stevia. Bring to a boil, whisking occasionally. 3. When beginning to boil over, remove from heat, whisk vigorously, and pour into a mug for immediate enjoying! YUMMM! Chocolate Banana Bread Overnight Oatmeal. Ok you guys. This jar of oats is about as close to heaven on earth as you can get! Ohhhhh boy are you in for a treat! I dare say this breakfast might make you become a morning person...! Chocolate Banana Bread Overnight Oatmeal. Vegan, Gluten-free. Serves one. 1. 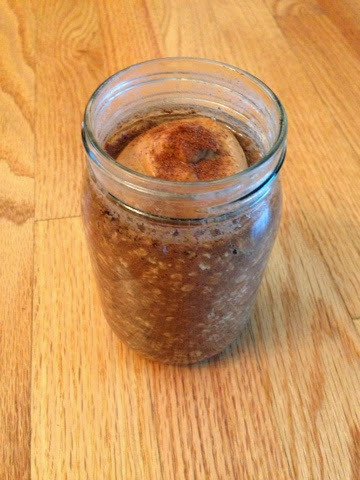 Combine oats and carob in a jar. Secure kid and give it a good shake to combine. 2. In a separate bowl, mash your naner. 3. Add mashed banana to jar and pour almond milk over. Mix well. 4. Cover and place in fridge at least 24 hours. In the morning, top with PB and optional cinn. DEVOUR!!!! Note: you can hear in the microwave if you want, but I think these are better left chilled. Prepare to fall in love. Not only is this bomb of a breakfast INSANELY DELICIOUS, but also...you make it in the microwave. Yeah. Told you you'd fall in love. Cinnamon Banana Bread Oatmeal; Vegan, Gluten-free. Serves one. 1. 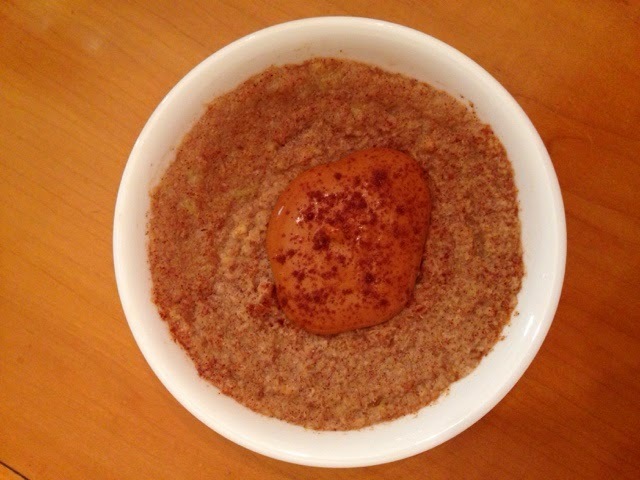 Place oats in a microwave safe bowl and add cinnamon and mashed banana. Mix well. Stir in 1 cup water and microwave high 2 minutes. 2. Top with PB and sprinkle with cinnamon. Eat! After feeling like I was coming down with something over the weekend, I've unfortunately today been hit hard by this nasty flu bug going around--and boy, I mean hard. It's rough--but vegan food always helps! And this soup sure did...temporarily at least! I made my bowl SUPER SPICY to try to "decongest" myself...but feel free to cut back on the chipotle powder. Otherwise, this is a lovely and super quick soup that is great for lunch or dinner--sick OR well! Enjoy! 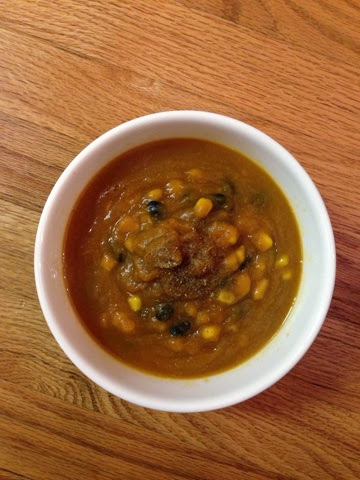 Spicy Chipotle-Pumpkin Soup; Vegan, Gluten-free. Serves one. 1. So easy...perfect lazy food haha! 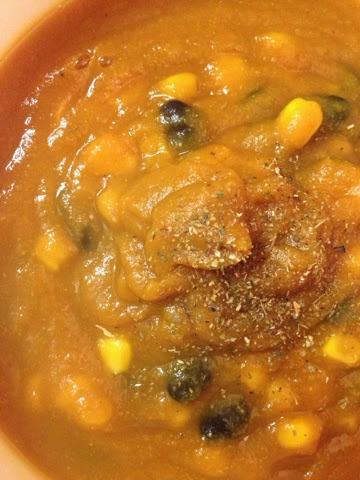 Combine pumpkin and broth in a sauce pan over medium heat. 2. Add spices and aminos and stir. 3. Add corn and beans and bring to a boil, stirring regularly. Reduce heat, and simmer about 10 minutes. 4. Serve hot, topped with dried oregano leaves and rustic toast. Mmm. If you're like me and unluckily got sick over Christmas, you weren't doing too much "ROCKIN' around the Christmas tree"...maybe not, but after you eat a comforting bowl of this hearty stew, you're sure to feel mostly (if not ALL!) better! 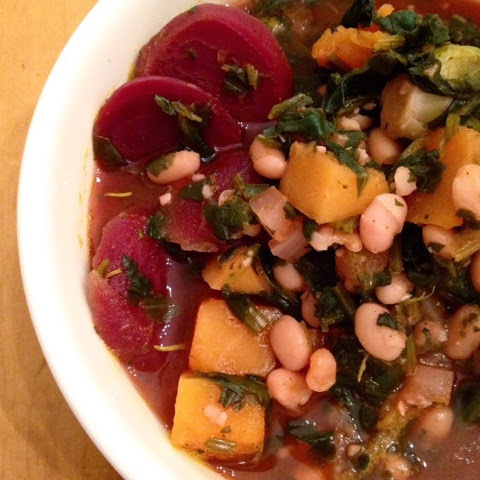 Soul-soothing Winter Vegetable Stew; Vegan, Gluten-free. Serves one. 1. Sauté onion and garlic in a little veggie broth until soft. Add spices (except pepper) and aminos and stir. 2. Add remaining veg broth, beans, spinach, and butternut squash. Bring to a boil and boil 2 minutes. 3. Reduce to a simmer, add beets, and simmer 5 minutes. 4. Remove from heat, add pepper, stir, and serve. Pairs beautifully with rustic toasted bread! Mmmmm. Merry (belated...) Christmas everyone! And Happy not-so-belated New Year! TFVG blog had a great year in 2014, but 2015 is going to be the best one yet...I can feel it! So many exciting things are happening with the blog right now...the first of which is my long awaited COOKBOOK! So many of you dear loyal followers have waited so patiently for my first collection of recipes...and I can officially say I have wonderful news for you all: I HAVE FOUND A PUBLISHER! Well...sort of hehe. I have decided I am going to self publish, or "indie publish" as many people call it these days. It's so hard to find willing publishers in this rough economy...people are so hesitant to invest in something so variable--publishing a book is a big risk, financially. And, in addition, many publishers I talked to were alarmed at my seriousness to publish, given my young age. Honestly, I don't blame them...I am young, in age. But I've also been through a lot for my age and have made some powerful nutritional discoveries--which ultimately cured my possibly fatal medical condition. Long story short, I empathize with the publishers--most 18 year olds are more interested in...other things...not in writing cookbooks...! I've always been a strange one 😰😂👍 #weirdopride I'm perfectly fine with indie publishing; I'm not in this to make money OR get famous. I just think it's pretty important to get my story out there-- let others who are sick...others who have been told there's no hope, no cure...let them know there is hope. There is a cure. And it's not a pill. It's not a magic formula. It's food! Ok...let's get to the point, shall we?! Haha. Basically I just wanted to let you all know that yes, The Fit Vegan Ginger Cookbook is definitely still happening! I'm sure some of you had started to doubt...again, I don't blame you! I'll admit the blog has been a little slow lately...it's so hard to find time to write now that I'm in college. Write, yes. But recipe develop? THAT is a whole other story...! Let me assure you that recipe creating for the cookbook has been in FULL SWING (and then some!)! I do have time for cooking...just not blogging, unfortunately. Which is why I can't give you all a release date for the cookbook still. I feel terrible! BUT. I CAN tell you it COULD possibly be as early as this summer--don't quote me on this, though. It's only a slight slight possibility at this point. But I had to give you a little hope, though! So don't give up. Don't stop reading. Don't stop waiting for the cookbook, because let me tell you--it's worth waiting for...! Anna "The Fit Vegan Ginger"